Virtualization and cloud benefits include increased flexibility, better asset utilization and reduced operational and maintenance costs. However, legacy business continuity solutions for virtualized mission-critical applications impede these benefits as they are complex to manage, do not support advanced virtualization features and require additional hardware and software resources. All the benefits that are expected when the application is virtualized – lower costs, simplified management – are lost. As a result, your IT strategy is not aligned – you need to juggle a virtualized production environment with a physical replication solution. Zerto’s award winning hypervisor-based replication software enables alignment of your Business Continuity & Disaster Recovery (BCDR) plan with your IT strategy. By using hypervisor-based data replication, you can reduce DR complexity and hardware costs and still protect your mission-critical virtualized applications, servers, and databases whether you’re using VMware’s vSphere hypervisor or Microsoft’s Hyper-V.
Zerto is software-only and hardware-agnostic – so you can replicate from any type of storage to any type of storage. Leverage existing, underutilized storage as the replication target. Leverage lower-cost storage at the replication site. Zerto dramatically reduces your day-to-day management complexity and streamlines your operations, eliminating the complexity typically associated with managing BC/ DR software solutions. Many of the manual tasks associated with a typical DR solution are automated with Zerto, reducing or eliminating errors. Select a VM in VMWare vSphere vCenter and, with a few clicks, it is replicated and protected. Zerto fully automates the entire failover and failback process, including creation of all the VMs, reconfiguring IP addresses and executing custom scripts. Absolutely NO snapshots. Zerto uses continuous replication and does not utilize snapshots which can slow down your production environment. With Zerto’s unique ‘Virtual Protection Group’ concept, you can protect an entire application spanning multiple VMs with a single policy and a single automated failover and failback process. Zerto seamlessly supports VMWare VMotion, DRS and HA, plus Storage VMotion and DRS. 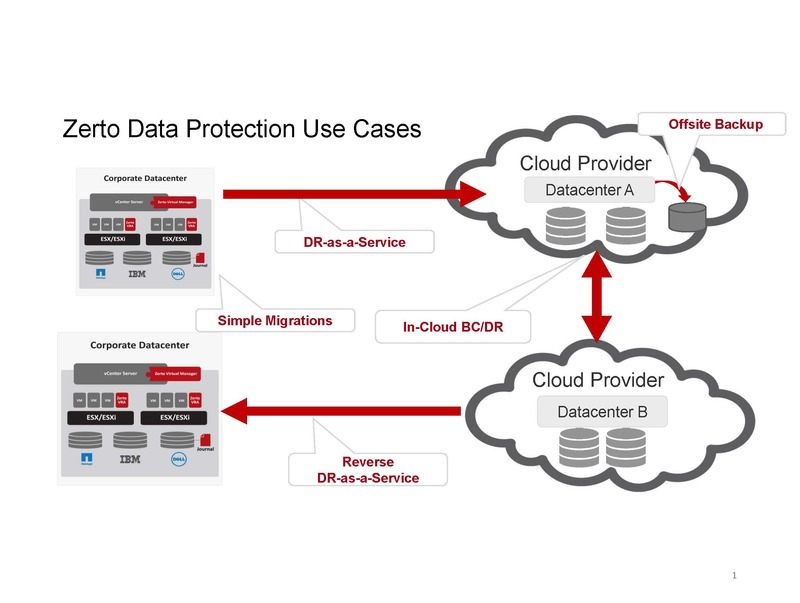 With Zerto, you are able to fully realize the benefits of VMWare and ensure your data protection strategy is maintained exactly as you have specified. Zerto’s software-automated installation does not require any changes to your storage or server infrastructure, making deployment simple and straightforward. The entire install process is completed in minutes. Protecting mission-critical applications, servers, & databases is not only about copying data. It is about ensuring application recovery, protecting from logical errors and frequently testing failover to ensure you can recover when needed. Protect entire applications by selecting the VMs that are part of the application and let Zerto do the rest. Ensure consistent application protection and recovery with Zerto’s Virtual Protection Group, with or without VSS support. Test failover with the click of a button, while maintaining protection of your production application. Recover from logical errors with ‘point-in-time’ recovery, enabling you to failover to a previous point in time. Zerto is the first hypervisor-based, virtual-aware, data replication software solution specifically designed for tier-one applications deployed on virtual infrastructure. It replaces traditional array-based replication and business continuity / disaster recovery solutions that are not built to deal with the virtual IT paradigm.